Teeth whitening is among the top cosmetic services requested by patients. As we age, the bright white appearance of the teeth begins to dull. When you combine age-related discoloration with stain-causing foods and lifestyle habits, the darkness of discoloration intensifies. Discoloration causes your smile to appear years older while negatively impacting your self-confidence. At D’Amico & Mauck, DDS,we understand just how much tooth discoloration can impact your life. We offer professional teeth whitening in Aurora to remove dark stains for a bright, white smile. Nowadays, there are a lot of over-the-counter whitening treatments, which are convenient and affordable. However, the whitening agents in the over-the-counter products are not professional grade. As a result, most people notice little results. If results do occur, results usually do not last. With professional whitening treatments from your dentist, our whitening agents are professional quality, which is only available to dentists. The powerful whitening agent is safe and effective while removing tough stains caused by age, foods, and lifestyle habits like smoking. At D’Amico and Mauck, DDS, we offer the convenience of over-the-counter whitening products that is combined with the professional results of in-office treatments. We offer a take-home kit to whiten your smile from the comfort of your own home and around your own schedule. To ensure the highest level of results and even distribution of the whitening agent, we provide you with custom-made trays. The trays will fit your teeth precisely to hold the bleaching gel in place to provide the highest level of results. Simply wear the trays as recommended and within a few days you will begin to see a brighter smile shine through. 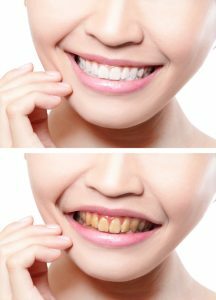 Over the course of the next couple of weeks, you will watch discoloration fade away as your teeth become several shades whiter. Although the kit is used at home, you will still achieve professional results that last. Our kit is effective for reversing discoloration caused by age, genetics, and stains from foods and drinks. In addition, stains and discoloration from tobacco use, certain medications, and medical conditions can be reversed. To ensure your new bright smile lasts, you can even use the home-kit for touch ups by joining our Whitening for Life program. You will keep your new smile bright with the touch-up gel, which you can pick up at your regular dental appointments for checkups and cleanings. If you are tired of living with dark tooth discoloration, now you can easily get a brighter smile right from your own home. While our whitening kit is safe and effective, it may not be suitable for everyone. We will need to perform a consultation to determine if teeth whitening is an option for you. If it is determined you are a candidate, we will create your custom-made trays and provide you with your kit. In just a couple of short weeks, you will have a new younger-looking smile with results that last. Contact our office today to schedule a consultation.